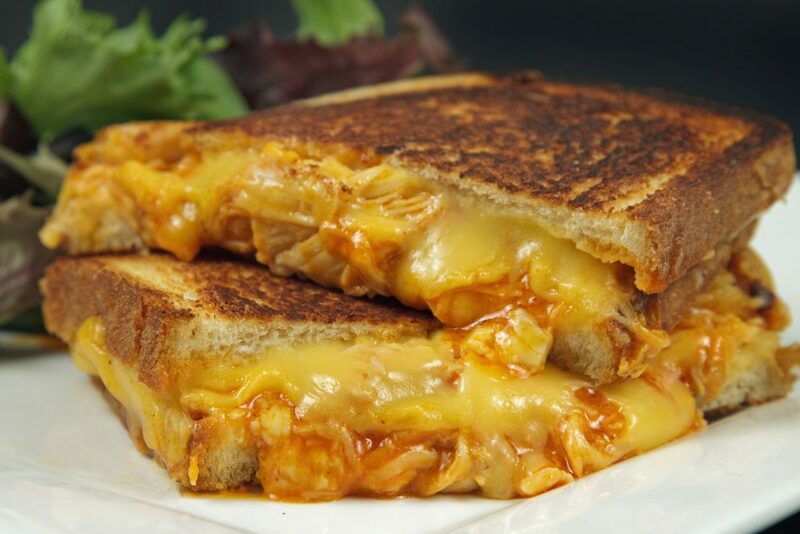 When you want a grilled cheese sandwich that will make you moan with pleasure, try my Buffalo Chicken Grilled Cheese Sandwich! You know I couldn’t go the whole summer without posting my precious once again……sigh. Forget the Rings, I am The Lord of the Blossoms!!! One thing I can count on is from about the end of June till early October there is a wealth of squash blossoms at our farmers market. And I hate to rub it in but the best part is, they’re just five for dollar! Needless to say that every week I make it to the Farmer’s Market, I buy squash blossoms, but sadly I don’t always get use them before they wilt. Most weeks I do find something to do with them, even if they just find their way into a salad, or on top of a pizza. I’ve made blossoms so many different ways and Lisa does humor me and tries them, but the only type she really likes is the original version stuffed with a blend of cheeses, lightly battered and quickly fried till golden brown. These are the ones that practically melt in your mouth when you bite into them! You can find the recipe for my stuffed zucchini blossoms here. 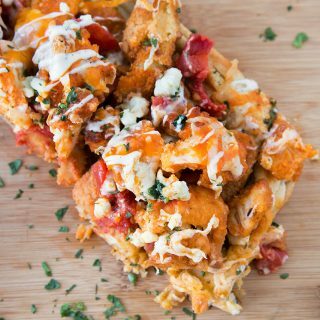 So let’s get to the main event, A Grilled Cheeses Sandwich stuffed with Buffalo Chicken and Gorgonzola Cheese Crumbles…..sigh. This is without a doubt my new favorite sandwich. I did test this sandwich four times before I decided on the right combination, and the chicken is soaked in my famous buffalo chicken sauce! But whether you make it with Cheddar, Velveeta, Monterey Jack or American I can promise you it will be delicious, although Yellow American won out in the end! Place the four slices of bread on a platter and begin topping each slice with 1/4 of the American cheese until it is all used up. 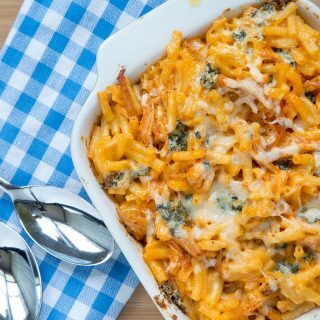 Divide the chicken between two of the slices, placing the shredded buffalo chicken on top of the American cheese. Add the gorgonzola crumbles on top of the chicken, divide between the two sandwiches. Place the top slice with the rest of the American cheese on top of the sandwich you just built. In a large frying pan or griddle on medium high heat, place half the butter and allow to melt, placing the grilled cheese onto the hot melted butter. Allow to continue to cook over low heat until the cheese has melted. Slice in half and serve immediately with plenty of napkins! **Here is the tricky part, you want to get the sauce almost to point of boiling, but do not let it boil, or get too hot. If the sauce gets too hot it will begin to separate. I actually get the sauce hot enough to melt the butter, then turn off the heat. By not over heating the sauce it will stay rich and thick and give the wings a wonderful coating. 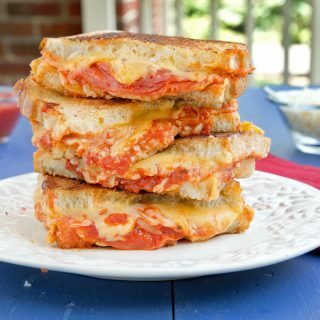 I love getting creative with grilled cheese, this looks amazing. Your sandwich is making me hungry! Thanks Amy, I do love a good grilled cheese sandwich! Now that’s a grilled cheese sandwich. For a minute I thought I was going to see squash blossoms in your buffalo chicken grilled cheese sandwich. Ever thought about stuffing the blossoms with Gorgonzola and doing that?! Either way, they both sound amazing. So the blossoms- I can eat sushi all day long but there is something about blossoms that make it hard. I need to keep trying. That sandwich looks absolutely delicious! And you have me craving squash blossoms. I am so tempted to get zucchini blossoms! They look amazing! Stuffed and fried. 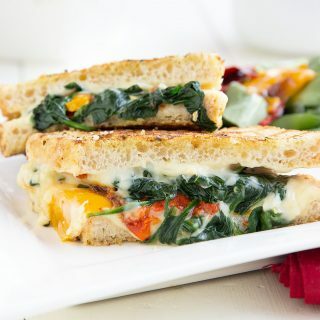 My Hubby already wants me to make the sandwich – ooooh, the melted cheese!!! Yum! PS: I am all for the Cheese Month, Chef! First you hook me with those gorgeous blossoms, and before you know it, I’m staring at some golden cheesy melty goodness. No fair! oo yum chef you’re killing me! what a fabulous meal! I am completely making this grilled buffalo chicken cheese sandwich for our supper club party this Thursday! It’s completely perfect. Those blossoms look delightful, so delicate! What a beautiful post. That sandwich looks highly addictive & those blossoms look like an absolute treat. 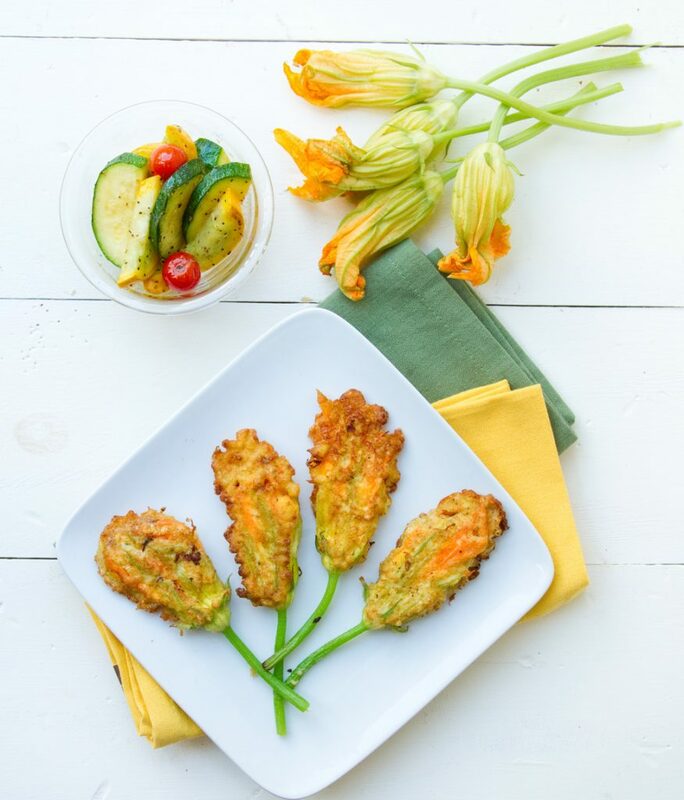 I love squash blossoms, they look incredible! The sandwich looks delicious but you had me at zucchini blossoms! I had never tried them before until my recent trip to Venice, Italy this summer and had them as an appetizer. They were incredible! Thanks for sharing. This grilled cheese sandwich is killing me, it’s my fave sandwich. I can’t stop staring at the photo — it looks amazing! And those stuffed zucchini blossoms just makes everything perfect. 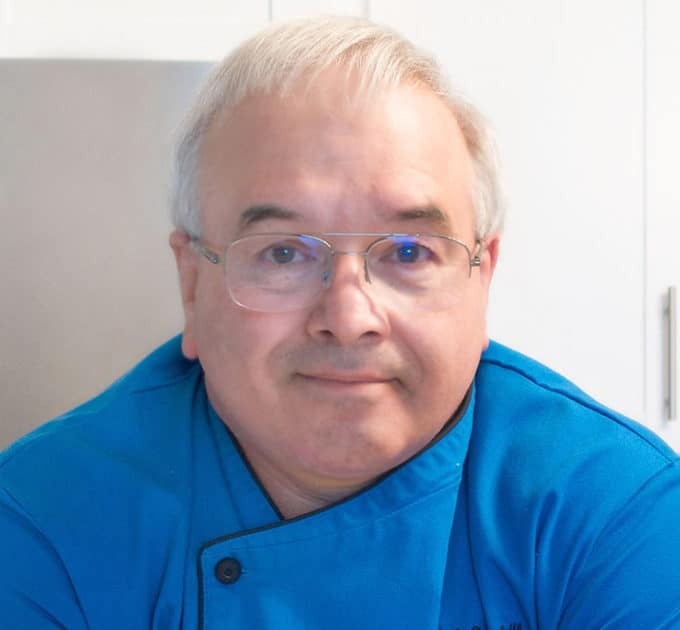 Thanks for sharing, Chef Dennis! Happy Monday! Gosh, that sandwich looks to die for! 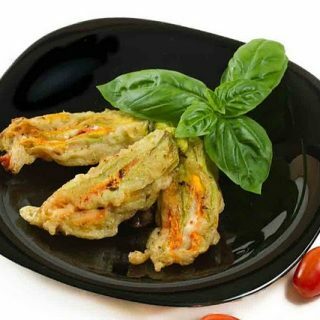 Awesome zucchini flower clicks! 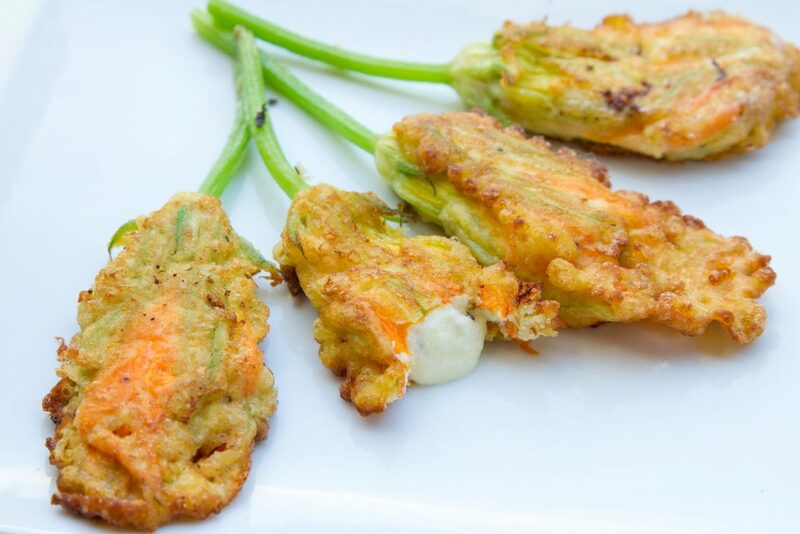 I love zucchini blossoms and can never seem to find them around here. Those look magnificent! 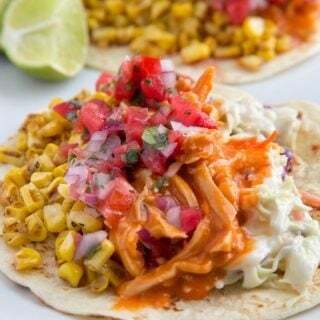 I wish I had some here so that I can try your recipe right away with your buffalo chicken sandwich. I am longing to know, what its like. By the way gorgeous photo Chef! Oh those blossoms! They look so good! Usually I leave a comment regarding the recipe, but looking at this sandwich with all that goodness oozing, I can only say that you’re the MAN! I really have to get some blossoms, after sampling them at a favorite Italian place close by…they were just melty, crunchy tasty!! Great looking sandwich, grilled cheese is the Coliseum of hot sandwiches..It just wont leave us. Can’t stop looking at that sandwich oozing cheese. OMG. The blossoms look PERFECT. Wow!! Good eats times 2.